Poop In The Woods When you gotta go, you gotta know. Summit two of the 46 High Peaks on this beautiful out and back in New York’s Adirondacks. Encompassing an area that is larger than Yellowstone, Yosemite, Grand Canyon, and the Smokies combined, New York’s Adirondack Park quietly claims the title of largest publicly protected area in the lower 48 states. 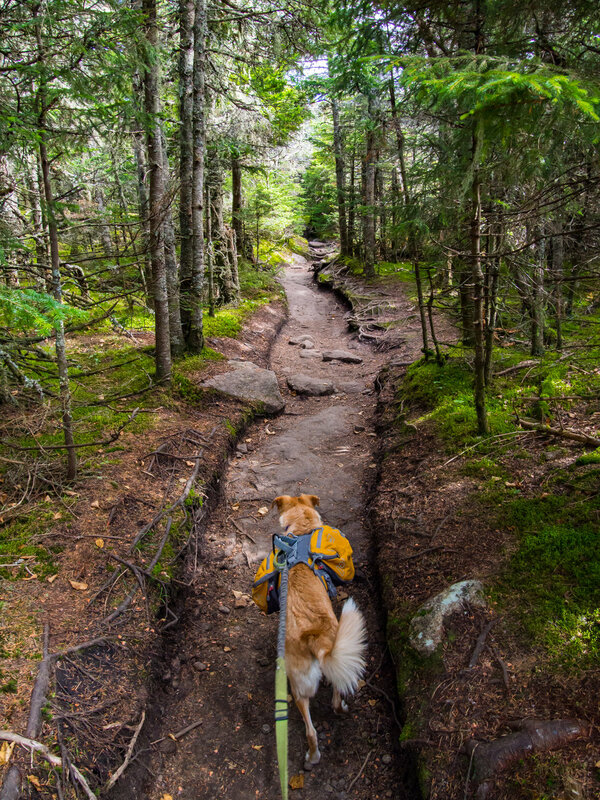 Over half the land within its boundaries is public, with over 2,000 miles of trails connecting the area’s lakes, forests, ridges and mountain summits. Within the park are the infamous High Peaks, 46 densely packed summits that are sought after by peak baggers looking to hike up every mountain on the list. The view of Cascade from the summit of Porter. Cascade and Porter are two of the most popular High Peaks to bag, given their easy access, short approach trails, and scenic vistas. Start your hike along the Cascade Mountain Trail from the trailhead parking along Route 73 west of Keen, NY. At the trailhead you’ll find a privy and a trail register. From there, the route ascends steadily, passing through mixed hardwood forest. After a mile, the forest transitions into fir and spruce trees, and you’ll scramble up a bare patch of rock to your first view of the surrounding landscape. From here, follow the trail to its junction with the Porter Mountain Trail, veering right. The trail traces the ridge through dense woods for a little over a half a mile, where a clearing of bare rock marks the summit of Porter. Look back the way you came to see views of Cascade’s bare summit. View from the summit of Cascade. Retrace your steps to the trail junction and continue along the Cascade Mountain Trail. After a short hike, the forest thins and the trail emerges onto bare rock marked with blazes and cairns, leading the way up to the summit of Cascade Mountain. Stay on the trail through the fragile alpine environment that grows above the tree line. 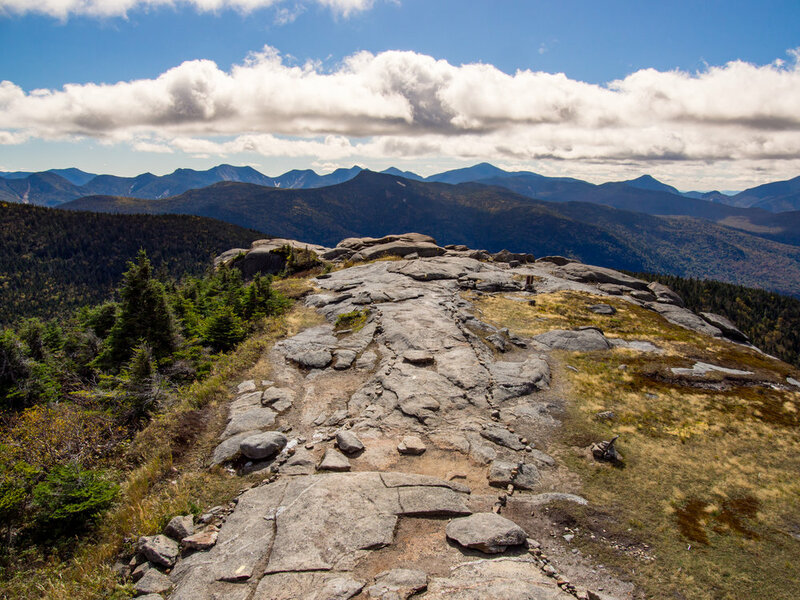 From the bare summit you’ll get a 360 degree view of the Adirondacks, the contours of the High Peaks shaping the horizon. It’s easy to understand why hikers return again and again to the Adirondacks. Apart from the worthy challenge presented by summiting all 46 High Peaks, few other places offer this kind of immersive experience with minimal effort. Walk just a short distance from any trailhead and the dense forest will surround you, the sweet scent of the evergreens will fill your nostrils, and the peaceful quiet of the wilderness will clear the thoughts from your mind. Stand on a summit, and the mountains offer a buffet of options for your next hike. All you need to do is pick one out and head for the trail. After you’ve had your fill, return to the trailhead along the Cascade Mountain Trail, signing out of the trail register as you pass. Difficulty: Moderate, with around 2,200 feet of elevation gain. Trailhead: Cascade Trailhead on Route 73, 7 miles west of Keen. Route: Follow the Cascade Mountain Trail to the junction with the Porter Mountain Trail. After a 6/10 of a mile on the Porter Mountain Trail, you’ll reach the summit of Porter. Return to the trail junction and continue up the Cascade Mountain Trail to the summit of Cascade. Return to the parking area by backtracking along the Cascade Mountain Trail. Overnight Possible: There are many options for overnight trips on trails through the Adirondacks. Follow Leave No Trace principles. Stop by the Adirondack Mountain Club’s High Peaks Information Center for great trip planning resources. Best Time To Go: From May to August the weather is warm, but the trails will be more crowded. Go in shoulder season from late September to mid October for cooler temps and stunning autumn colors. Where to Poop: Portable toilets are available at the parking area, with additional privies located at the beginning of the Cascade Mountain Trail and at its junction with the Porter Mountain Trail. Jonathan Mauer is a backpacker and ultrarunner living in the Philadelphia area. Jonathan thruhiked the Appalachian Trail in 2009 and has been exploring the outdoors ever since. Follow @blacklistmauer on Twitter and Instagram! Oct 14 Boy Scouts - Now with 100% More Girls!